The Quaternary glaciation, also known as the Pleistocene glaciation, is an alternating series of glacial and interglacial periods during the Quaternary period that began 2.58 Ma (million years ago), and is ongoing. 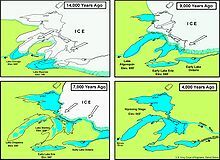 Although geologists describe the entire time period as an "ice age", in popular culture the term "ice age" is usually associated with just the most recent glacial period. Since earth still has ice sheets, geologists consider the Quaternary glaciation to be ongoing, with earth now experiencing an interglacial period. The role of Earth's orbital changes in controlling climate was first advanced by James Croll in the late 19th century. Later, Milutin Milanković, a Serbian geophysicist, elaborated on the theory and calculated that these irregularities in Earth's orbit could cause the climatic cycles now known as Milankovitch cycles. They are the result of the additive behavior of several types of cyclical changes in Earth's orbital properties. Changes in the orbital eccentricity of Earth occur on a cycle of about 100,000 years. The inclination, or tilt, of Earth's axis varies periodically between 22° and 24.5° in a cycle 41,000 years long. The tilt of Earth's axis is responsible for the seasons; the greater the tilt, the greater the contrast between summer and winter temperatures. Precession of the equinoxes, or wobbles of Earth's spin axis, have a periodicity of 26,000 years. According to the Milankovitch theory, these factors cause a periodic cooling of Earth, with the coldest part in the cycle occurring about every 40,000 years. 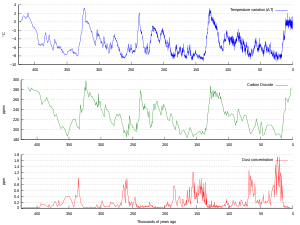 The main effect of the Milankovitch cycles is to change the contrast between the seasons, not the overall amount of solar heat Earth receives. The result is less ice melting than accumulating, and glaciers build up. Milankovitch worked out the ideas of climatic cycles in the 1920s and 1930s, but it was not until the 1970s that a sufficiently long and detailed chronology of the Quaternary temperature changes was worked out to test the theory adequately. Studies of deep-sea cores, and the fossils contained in them, indicate that the fluctuation of climate during the last few hundred thousand years is remarkably close to that predicted by Milankovitch. An important component in the development of long-term ice ages is the positions of the continents. These can control the circulation of the oceans and the atmosphere, affecting how ocean currents carry heat to high latitudes. Throughout most of geologic time, the North Pole appears to have been in a broad, open ocean that allowed major ocean currents to move unabated. Equatorial waters flowed into the polar regions, warming them. This produced mild, uniform climates that persisted throughout most of geologic time. Studies have shown that the uplift has taken place in two distinct stages. The initial uplift following deglaciation was rapid (called "elastic"), and took place as the ice was being unloaded. After this "elastic" phase, uplift proceed by "slow viscous flow" so the rate decreased exponentially after that. Today, typical uplift rates are of the order of 1 cm per year or less. In northern Europe, this is clearly shown by the GPS data obtained by the BIFROST GPS network. Studies suggest that rebound will continue for about at least another 10,000 years. The total uplift from the end of deglaciation depends on the local ice load and could be several hundred meters near the center of rebound. Glaciation has been a rare event in Earth's history,  but there is evidence of widespread glaciation during the late Paleozoic Era (300 to 200 Ma) and the late Precambrian (i.e. the Neoproterozoic Era, 800 to 600 Ma). Before the current ice age, which began 2 to 3 Ma, Earth's climate was typically mild and uniform for long periods of time. This climatic history is implied by the types of fossil plants and animals and by the characteristics of sediments preserved in the stratigraphic record. There are, however, widespread glacial deposits, recording several major periods of ancient glaciation in various parts of the geologic record. Such evidence suggests major periods of glaciation prior to the current Quaternary glaciation. ^ Lorens, L.; Hilgen, F.; Shackelton, N.J.; Laskar, J.; Wilson, D. (2004). "Part III Geological Periods: 21 The Neogene Period". In Gradstein, Felix M.; Ogg, James G.; Smith, Alan G. (eds.). A Geologic Time Scale 2004. Cambridge University Press. p. 412. ISBN 978-0-521-78673-7. ^ Berger, A.; Loutre, M.F. (2000). 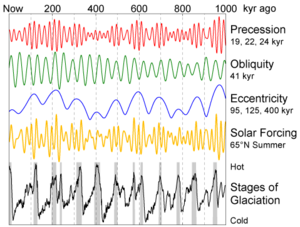 "CO2 And Astronomical Forcing of the Late Quaternary". Proceedings of the 1st Solar and Space Weather Euroconference, 25-29 September 2000. 463. ESA Publications Division. p. 155. Bibcode: 2000ESASP.463..155B. ISBN 9290926937. ^ Lockwood, J.G. ; van Zinderen-Bakker, E. M. (November 1979). "The Antarctic Ice-Sheet: Regulator of Global Climates? : Review". The Geographical Journal. 145 (3): 469–471. doi: 10.2307/633219. JSTOR 633219. ^ Augustin, Laurent; et al. (2004). "Eight glacial cycles from an Antarctic ice core". Nature. 429 (6992): 623–8. Bibcode: 2004Natur.429..623A. doi: 10.1038/nature02599. PMID 15190344. ^ Fletcher, Benjamin J.; Brentnall, Stuart J.; Anderson, Clive W.; Berner, Robert A.; Beerling, David J. (2008). "Atmospheric carbon dioxide linked with Mesozoic and early Cenozoic climate change". Nature Geoscience. 1: 43–48. Bibcode: 2008NatGe...1...43F. doi: 10.1038/ngeo.2007.29. ^ Pagani, Mark; Huber, Matthew; Liu, Zhonghui; Bohaty, Steven M.; Henderiks, Jorijntje; Sijp, Willem; Krishnan, Srinath; DeConto, Robert M. (2011). "The Role of Carbon Dioxide During the Onset of Antarctic Glaciation". Science. 334 (6060): 1261–4. Bibcode: 2011Sci...334.1261P. doi: 10.1126/science.1203909. PMID 22144622. ^ Lidmar-Bergström, K.; Olsson, S.; Roaldset, E. (1999). "Relief features and palaeoweathering remnants in formerly glaciated Scandinavian basement areas". In Thiry, Médard; Simon-Coinçon, Régine (eds.). Palaeoweathering, Palaeosurfaces and Related Continental Deposits. Special publication of the International Association of Sedimentologists. 27. Blackwell. pp. 275–301. ISBN 0-632 -05311-9. ^ Johansson, J.M. ; Davis, J.L. ; Scherneck, H.‐G. ; Milne, G.A. ; Vermeer, M.; Mitrovica, J.X. ; Bennett, R.A.; Jonsson, B.; Elgered, G.; Elósegui, P.; Koivula, H.; Poutanen, M.; Rönnäng, B.O. ; Shapiro, I.I. (2002). "Continuous GPS measurements of postglacial adjustment in Fennoscandia 1. Geodetic results". Geodesy and Gravity/Tectonophysics. Bibcode: 2002JGRB..107.2157J. doi: 10.1029/2001JB000400. ^ Richerson, Peter J.; Robert Boyd; Robert L. Bettinger (2001). "Was agriculture impossible during the Pleistocene but mandatory during the Holocene? A climate change hypothesis" (PDF). American Antiquity. 66 (3): 387–411. doi: 10.2307/2694241. Retrieved 29 December 2015. ^ J Imbrie; J Z Imbrie (1980). "Modeling the Climatic Response to Orbital Variations". Science. 207 (4434): 943–953. Bibcode: 1980Sci...207..943I. doi: 10.1126/science.207.4434.943. PMID 17830447. ^ Berger A, Loutre MF (2002). 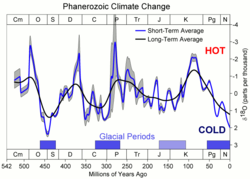 "Climate: An exceptionally long interglacial ahead?". Science. 297 (5585): 1287–8. doi: 10.1126/science.1076120. PMID 12193773. CS1 maint: Uses authors parameter ( link) "Berger and Loutre argue in their Perspective that with or without human perturbations, the current warm climate may last another 50,000 years. The reason is a minimum in the eccentricity of Earth's orbit around the Sun." ^ "NOAA Paleoclimatology Program – Orbital Variations and Milankovitch Theory". A. Ganopolski, R. Winkelmann & H. J. Schellnhuber (2016). 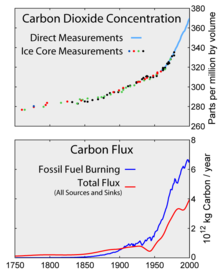 "Critical insolation–CO2 relation for diagnosing past and future glacial inception". Nature. 529: 200–203. Bibcode: 2016Natur.529..200G. doi: 10.1038/nature16494. PMID 26762457. CS1 maint: Uses authors parameter ( link) M. F. Loutre, A. Berger, "Future Climatic Changes: Are We Entering an Exceptionally Long Interglacial? ", Climatic Change 46 (2000), 61-90. ^ Berger, A.; Loutre, M.F. (2002-08-23). "An Exceptionally Long Interglacial Ahead?" (PDF). Science. 297 (5585): 1287–8. doi: 10.1126/science.1076120. PMID 12193773. Clark, Peter U.; Bartlein, Patrick J. (1995). "Correlation of late Pleistocene glaciation in the western United States with North Atlantic Heinrich events". Geology. 23 (4): 483–6. Bibcode: 1995Geo....23..483C. doi: 10.1130/0091-7613(1995)023<0483:COLPGI>2.3.CO;2.